Although I only made three dishes, it was quite a bit of work simply because there was lots of chopping to do. I needed chopped veggies for both the salad and for adding to the gyros. I decided to chop everything I needed and make a tray up earlier in the day. I then just added the veggies to the salad and gyros from the previously prepared tray. This certainly made dinner time much easier. This recipe was adapted from Danielle’s recipe that I found on All Recipe’s. The recipe makes a huge batch because it is an actual restaurant recipe. I originally divided it by 12, but still felt it was too much. I took my 1/12 recipe and then halved that. So, if my math serves me correct….I made 1/24 of the original recipe. I only wanted enough for the dinner salad in case I didn’t like it. In the end, I had more than enough for the salad and enough left over for another smaller salad. Here is my scaled down version of the original recipe. 2/3 tsp. is a bit tricky. I was so glad I have these sliding measuring spoons from Pampered Chef! Mix all of the ingredients together (with the exception of the vinegar). Once mixed, add the vinegar and mix vigorously until the ingredients are well blended. Store in a tightly covered container at room temperature. This homemade salad dressing was my Grandma Cooley’s. She used to make it and passed it along to my mom who used it as the base for her potato salad. It has great flavour, but I sometimes add extra spices and/or pickle juice for a little extra kick when making potato salad. Prepared mustard is also great for kicking up the flavour in the final stages if you feel you need to. Place all of the ingredients in a double-boiler. Stir and cook over boiling water until thick and bubbly. Remove from heat and refrigerate. To use this dressing recipe for a potato salad, my mom would combine equal parts of the dressing with milk and either Miracle Whip or Mayo. She suggested using 1/3 of a cup of each. Mix to combine and stir into potato salad. When making a potato salad, I generally make about 1 potato per person. I alter the additional items based on the number of potatoes I use in the salad. Although I don’t always use the same ingredients, this is what I generally add to the base salad. If you’re are planning to serve a number of people and need to make a large salad, you may want to try this speedy method of removing the peels from all of those potatoes. Brilliant! Post by Leo Morten Lund. When it comes to packing my lunch for work, I am pretty lazy. I pretty much have the same thing almost every day. In order for this to work, you have to find something you really like. For me, it is my salad. I’m not saying I don’t occasionally change things up, but I would say I ate this salad about 75% of the days this year. I know that sounds boring, but its very simple to make, healthy and delicious. I make this every morning and it takes me about 4 minutes. I place the ingredients in my salad container in the order listed above. 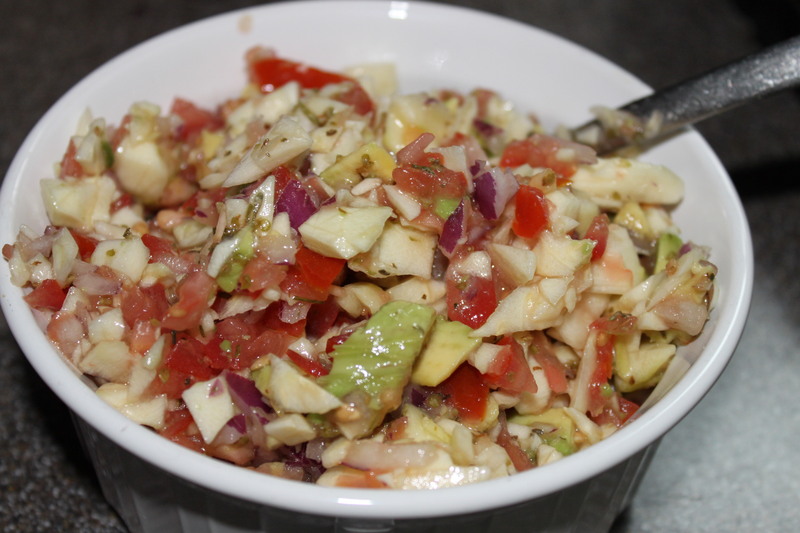 The order is important because the red onion prevents both the avocado and apple from browning. Seal the container. 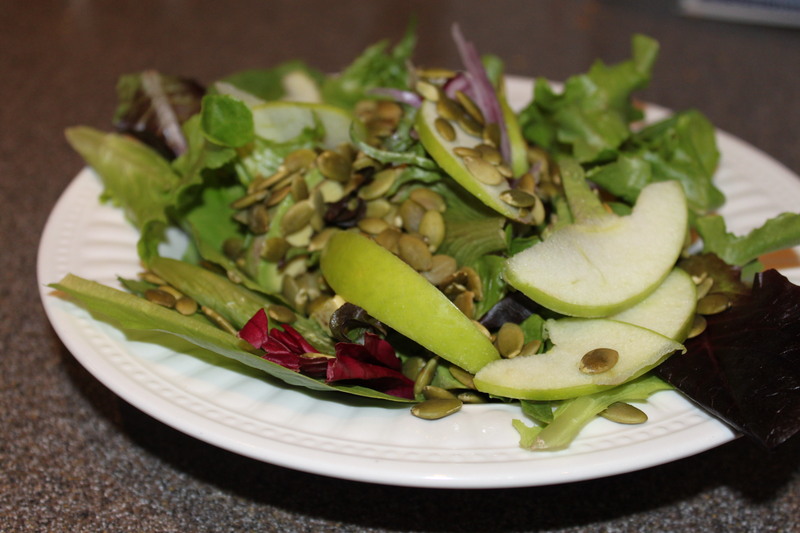 This dressing recipe is taken from Lyn Genet-Recitas’s book called The Plan. It is one of my very favourite homemade dressings. It is light and “citrusy” and has great flavour. I usually mix up a batch on Mondays (takes me no more than 3 or 4 minutes) and it generally lasts me the week as I only use about 1 1/2 Tablespoons per serving. Combine the ingredients and store in an air tight container in the fridge for up to one week. I love this salad. I can honestly say that I never get sick of it. It always looks delicious with the purple onion and deep green pumpkins seeds and avocado. This is delicious enough to serve to company and yet simple enough to eat every day. One of my all time favourite recipes. Thursday was the staff appreciation lunch at my kid’s school and the PAC had planned a Mexican themed feast for all of the great staff in the school. I signed-up to bring a salad and of course, was looking for something that would fit with the theme. I came across this recipe on Divas Can Cook and it not only looked incredible, but had great reviews from their readers. I actually love both corn and black beans, but since going on The Plan have realized that neither would be considered “friendly foods” for me personally. Knowing my body and how it reacts to certain foods doesn’t mean I can’t eat them, it just means that I am aware and more mindful of what else I eat on the same day and the day after. So, you guessed it…..I made a double batch, one for the luncheon and one for dinner on Thursday night. Let’s just say the Diva’s did not disappoint. I loved the vegetable combination and although I was a bit skeptical when making the dressing, it came together to make a really yummy dish. We ate it as a salad along side the Chicken Fajitas we had for dinner, but I can see it being a great topping on rice or even served over a chicken breast. I am sure it would make a great dip with nachos as well. Yummy! This recipe was taken directly from the Divas Can Cook site and I followed it almost exactly. I did include the optional avocado and only used 1/2 teaspoon of salt. I also used freshly squeezed lime juice as the recipe suggests. Combine the beans and chopped vegetables in a large bowl. Mix the Chili Lime Dressing ingredients together in a small bowl. Add the dressing to salad and toss to combine.